Are you in need of a little self-pampering? What woman isn't? Well, if you are wanting to treat yourself to some top of the line skincare items or if you just want to try out some high end makeup packed with skin-loving ingredients, then just head right over to your local Neiman Marcus's Le Metier de Beaute counter! I am so excited to share about my afternoon spent at Le Metier de Beaute and my first impressions of the brand. The brand recently contacted me to scope out their line at Neiman Marcus and to try out their new and revolutionary Chem Pro Peel and Mask Set. As a lover of high end makeup, skincare, and self-pampering beauty treatments, I of course jumped at the chance! They invited me to bring a +1. So, my Mom and I were both able to experience the brand. The verdict? We had a wonderful experience! Le Metier de Beaute is a somewhat new botique luxury skincare and makeup line. 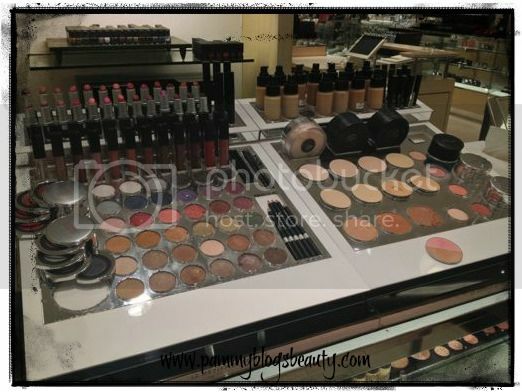 Le Metier de Beaute counters are exclusive to Neiman Marcus stores. However, the products are also sold at Saks and Nordstroms online. Le Metier de Beaute translates to mean "craft of beauty". The name certainly is fitting as the line takes great pride in crafting the best possible products. The skincare hosts sophisticated delivery systems for skincare powerhouses like retinol, glycolic acid, and peptides. The makeup is not just makeup: It is makeup packed with beneficial skincare ingredients. What a fabulous bonus to get anti-aging benefits from your foundation, powders, and eye shadows! To find out more, please keep reading! The Chem Pro Peel and Mask Set is a 2-part at home spa facial treatment. Karen recommended that I use the Chem Peel set about 2x a week for my sensitive normal-dry skin. She mentioned that those with more oily and less sensitive skin can use it more frequently. Since I am still a nursing mother, I did not try the Chem Peel as it contains Retinol. However, my Mom tried it and liked the results. She really liked how her skin looked and felt after the 2-part treatment peel and mask. While I did not try the Peel, I did try the Glow 10 Mask that comes with the Peel and Mask Set. The mask is a peel-off style mask. The texture is thick and tacky like glue. Karen spread it over my skin with a brush and it felt so soothing and nice going on! It felt comfortable the whole time it was on my skin (about 5 minutes). The mask peels off when dry or you can remove it with water. The Glow 10 Mask left my skin feeling nourished and soft. The kit retails for $265.00. I know, this is *so* pricey. However, it is somewhat more affordable when you compare it to the cost of going to the spa for a facial treatment. Personally, this is a bit more than I typically spend on skincare. However, if this product was in my price range and budget, there is no question that I would love to purchase it! CHEM60 Pro-Peel, with a proprietary blend of salicylic and glycolic acids, gently penetrates the skin's surface and desquamates dead skin cells to reveal younger-looking skin in as little as 60 seconds. 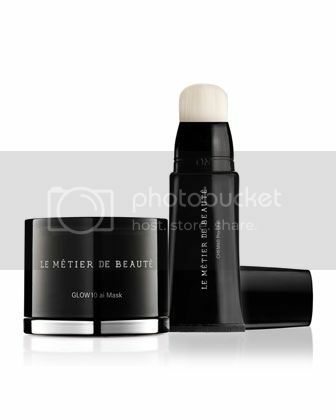 After trying the Glow 10 Mask, Karen, our Le Metier de Beaute product specialist, introduced us to the rest of the brand. She walked us through a brief description of each product category. Then she proceeded to apply skincare and makeup. Many of Le Metier de Beaute's skincare and makeup items contain Retinol. While this is a very good thing, as I mentioned before, I am avoiding Retinol as I am still a nursing mother. So, Karen took care to choose products for me that did not contain Retinol. Let me tell ya'll, as soon as I can use Retinol again, I am *all about* these Le Metier products containing this powerhouse ingredient! Retinol is the #1 age fighter! How cool is it that Le Metier includes this amazing ingredient in items like their best selling Tinted Moisturizer, Foundation, and Concealer. Besides their inclusion of Retinol, Le Metier de Beaute products feature a proprietary delivery system Syntoc Actif. According to Karen, this delivery system allows the active ingredients to penetrate deeper into your skin. I got to try so many great skincare and makeup items. However, there were a few in particular that "stood out"! The Replenishing Daily Solution: This is a daily moisturizer with SPF that is loaded with anti-aging skincare ingredients. Peau Vierge Anti-Aging Complexe Tinted Treatment: This is a best-seller from Le Metier. I did not personally try it as it contains Retinol. However, I am highly intrigued! Kaleidoscope Cheek and Eye Kits: These are packaged just beautifully! They are stacked up and fan out when opened. Really, really, pretty and functional packaging. The shadows are designed to be layered versus applied in typical "lid, crease, and highlight" format. Interesting! Lipstick: I tried out the Lipstick in Palm Beach which is honestly one of the most beautiful shades that I think I have ever worn! It is a lovely and slightly coral-toned peachy pink. 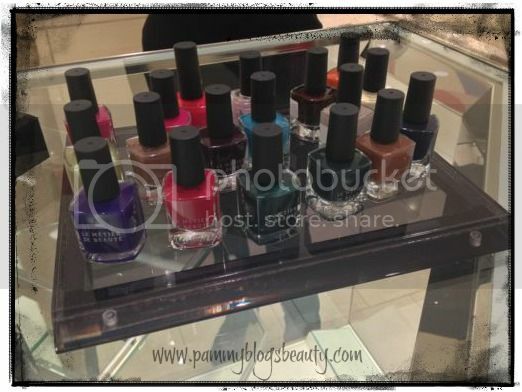 Nail Polishes: Le Metier offers adorable mini polishes for only $10 each! These would be great for stocking stuffer gifts or just a little affordable treat for yourself from a high-end beauty brand! Personally, I love mini products as I rarely seem to completely use up Nail Polish anyways before it dries out. My finished makeup look was very soft and natural. 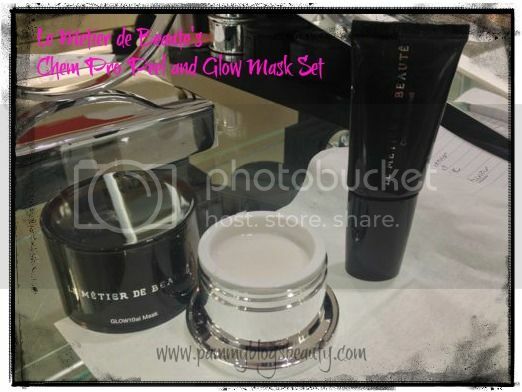 My Mom's and my experience at the Le Metier de Beaute counter was amazing! We had a great time and left feeling refreshed and beautiful. Karen even gave us a few samples before we left. What a treat! Le Metier de Beaute is a high-end luxury brand and the prices clearly reflect that; but, you are getting more than just pretty packaging with the higher price tag. You are getting innovative skincare with a unique Syntoc Actif delivery system. The products use ingredients that are clinically proven to fight aging. Also, the makeup that is packed with antioxidants, hyaluronic acid, and other great ingredients. Your skin will love the nourishment that Le Metier de Beaute provides. I know mine does! As ya'll can tell, I have a great first impression of this brand and would love to learn more! Edited to Add: I came home from my Christmas travels to find an amazing package of LeMetier products waiting for me! Reviews will be coming very soon!!! So, stay tuned! Also, the facial was complimentary. This sounds great! Definitely worth trying. I will have to check out that counter next time Im at Lenox! Great review! !